Arsenal’s performance against Spurs in the North London Derby was one of the most passionate in Premier League history. There was a possessed quality to the performance of Unai Emery’s team which eventually proved irresistible in the finest game of the season so far. The tone was set as early as the fourth minute when Lucas Torreira snapped at Dele Alli’s heels and threw in a hefty challenge for good measure. Spurs are no shrinking violets but seemed utterly undone by Arsenal’s early urgency and aggression. By the ninth minute, the home side led 1-0 thanks to a Pierre-Emerick Aubemayang penalty and more goals seemed likely as Spurs reeled. Then all changed utterly. In the 29th minute slipshod Arsenal marking let Eric Dier get in a header from an Alli free-kick. Bernd Leno should have saved but spooned the ball into the net. Four minutes later, a Spurs breakaway sent Son Heung-min galloping into the Arsenal box. Rob Holding’s sliding challenge was reckless but made no contact with Son whose collapse was positively Neymarian. Mike Dean fell for it, Harry Kane scored the penalty and Spurs were into an entirely undeserved 2-1 lead. Dier’s goal had sparked a hold-me-back-boys-style schemozzle between the celebrating Spurs players and the Arsenal subs. Arsenal’s extreme fervour crossed a line at times, as when Shkodran Mustafi and Granit Xhaka were booked for challenges on Son and Alli that evoked memories of more agricultural eras, but also lent the game an extraordinary atmosphere. Metropolitan media favourite it may be but North London’s tribal shoot-out seldom possesses the visceral quality of its Manchester and Merseyside counterparts. This one was different. On and off the pitch, it felt like an English version of the Buenos Aires Superclasico. At half-time Emery might have felt like repeating Alf Ramsey’s 1966 exhortation, “You’ve won it once. Now go out there and win it again.” In keeping with the feverish temper of the day he gambled big, sending in Aaron Ramsey and Alexandre Lacazette. Both contributed hugely to a second-half tour de force. Ramsey’s run forward to latch on to Hector Bellerin’s through pass saw the ball break to Aubemayang whose finish for the equaliser was instantaneous and emphatic. The Gabonese international’s arrival at the Emirates was relatively unheralded considering his 98 goals in 144 Bundesliga games for Borussia Dortmund. His Premier League tally of 20 from 27 is merely business as usual. 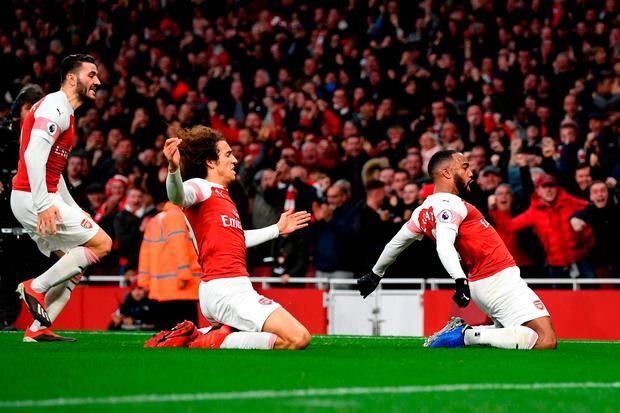 The subs combined to put Arsenal ahead, Ramsey’s run setting up Lacazette’s daisy-cutter, before a final goal involving the home team’s two best players, Aubameyang slipping in Torreira to apply a perfect angled finish. Latest in a long line of top-class Uruguayan hard men, the 22-year-old midfielder epitomises the new style Arsenal. He could do for them what N’Golo Kante did for Leicester and Chelsea. In the twilight years of Arsene Wenger’s reign there was a bloodless, dispassionate feel to even the better Arsenal performances. Faced with a physical challenge they tended to withdraw with an aristocratic sniff of disdain. Yesterday they tore into everything like a GAA team playing a first ever county final. The new manager has changed the nature of his team and in doing so made them the most fun side to watch in the Premier League. They bear a striking resemblance to last season’s high-tempo, all-action Liverpool. Jurgen Klopp’s team are a different animal now. They’re suffering from a kind of whack a mole effect. The addition of Alisson and the imperious Virgil van Dijk and the ever-improving form of Trent Alexander Arnold and Andy Robertson has given them a defensive solidity previously lacking. But this has coincided with their main attacking players going off the boil. Roberto Firmino is in wretched form, Mo Salah was subbed yesterday after a performance high on both effort and frustration and the breaks didn’t go Sadio Mane’s way either. Last season the trio contributed an incredible 91 goals. With roughly a third of this term gone, their tally is 21. It’s a tribute to the team’s resilience that Liverpool are managing to keep pace with a Manchester City side who’ve scored 16 more league goals. Van Dijk’s volley from the edge of the box was so badly mis-hit he’d headed back to defence in disgust. It was looping over when Jordan Pickford, as though trying to prevent a Liverpool point, stretched and knocked it on to the crossbar where it hopped before falling into the path of Divock Origi. Having earlier hit the post from two yards, Origi proved deadly from one. The Belgian striker hadn’t played in the Premier League all year. This was a return of Tyson Fury proportions. It was the last-gasp winner to end all last-gasp winners. Klopp’s sprint on to the field to hug Alisson showed he could hardly believe it either. If those attackers start clicking, and they’re probably too good not to, City won’t repeat last season’s walkover. Arsenal’s sights will be set lower than Liverpool’s but a lot higher than seemed probable at the start of the season. They could do with making the same kind of investment as Liverpool. Only City have scored more goals but the likes of Crystal Palace, Leicester and Wolves have better defensive records. Add a world-class goalkeeper and central defender and great things will be possible. They’re still not the finished article but the Gunners have found the right man for the job. Something good is happening at The Emirates. Arsenal are becoming what they were when Wenger was at his best. They’re a team you’d love to watch every week.